At school, Tooru runs into his friend, Pakerata, who has been away for a while on sick leave. Continue Reading "Wagaya no Oinari-sama. – 22"
On Kaminejima, Suzaku wakes up to find himself with Anya and C.C., the former of whom reveals that she’s currently Marianne, the mother of Lelouch and Nunnally. Continue Reading "CODE GEASS R2 – 21"
For those familiar with Macross Plus, you’re probably aware that the ever-so-talented composer, Kanno Youko, has always been one of the reasons why its music has been so memorable. For a longtime Macross fan such as myself, I was extremely happy when I heard that she would be doing the music for Macross Frontier as well. Reading this, you might be wondering what any of it has to do with Sakamoto Maaya, who performs the first opening song to the series. Well, this actually dates back to Maaya’s debut as a seiyuu back in 1996, when she starred as Kanzaki Hitomi in Tenkuu no Escalfowne, better known in English as The Vision of Escaflowne, which led to her working together with Youko on “Yakusoku wa Iranai” 「約束はいらない」 (No Need for Promises), the opening theme for the series. 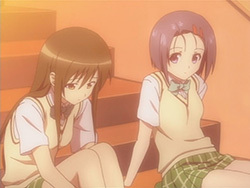 After working together with Youko to release numerous singles and albums featuring songs for series such as Record of Lodoss War (TV series), Cardcaptor Sakura, RahXephon, and Wolf’s Rain, the two parted ways on Maaya’s fifth single release, Loop, the first ending theme to Tsubasa Chronicle. It’s been three years since then, and the two have reunited to work on Macross Frontier with this song—Triangular. Continue Reading "Sakamoto Maaya – Triangular PV (Macross Frontier OP1)"
Prelude to the events of CODE GEASS R2, C.C. and Kallen are staying in a safe house under the guise of a sickly older sister and her supportive, cute, lovable younger sister respectively. Continue Reading "CODE GEASS R2 – Picture Drama 0.923"
In accordance with Treize’s plan to create a diversion, sneak into the house, and use the wireless radio on the third floor, Lillia ignites some dynamite and throws it into the kitchen stove’s furnace. Continue Reading "Allison & Lillia – 21"
After reflecting on her experiences on Earth, Yami reminds herself that she’s an assassin and decides to look for a job. 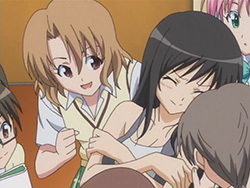 At school, Yui tries to coordinate what her class is going to do for the culture festival and gives only two options, a calligraphy display or a region research exhibit, much to the everyone’s disappointment. 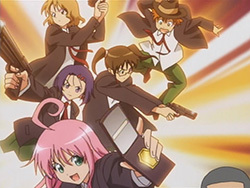 Continue Reading "To LOVE-Ru – 22"
With her gun pointed at Mio, Minna asks her to promise never to wear a Striker Unit again, since her powers as a Witch have weakened; however, Mio claims she still has to fly and Minna finds herself unable to stop her. Continue Reading "STRIKE WITCHES – 09"
Upon being asked about dates by her friends, Mika reveals a little too much information and overwhelms everyone with her explicit depiction. Continue Reading "Nogizaka Haruka no Himitsu – 08"
Pretending that Howard Glass was killed in the Vajra attack, Leon takes control of the military and orders the launch of the Battle Frontier. Continue Reading "Macross Frontier – 21"
Disliking how the fight is unfair being two on one, Kazehana steps in front of Tsukiumi’s attack to protect the Hire Sekirei. 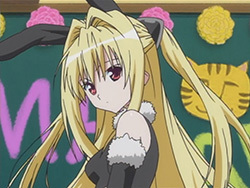 Continue Reading "SEKIREI – 09"
Kira manages to defend himself against Kibune’s blade, and despite the repeated attacks taking their toll, Kira remains active. Continue Reading "Bleach – 185"
In order to profit off their magical tanks, Gioconda tells Ducuris to force the coast line country of Vihard to buy their cheapest ones first and let demand naturally spread to the richer countries. Continue Reading "Slayers REVOLUTION – 09"
As the Sentan Island military forces fire at the giant test-type Xam’d, Haru hears a woman’s voice come from it saying that it wants to live, just like Akiyuki had done. Continue Reading "Xam’d Lost Memories – 07"
On her newfound shortcut to school, Hikari comes across Ogata Aoi, secretary of the Takishima Group president (i.e. Kei’s grandfather), who’s been instructed to observe Kei’s school life at Hakusenkan. Continue Reading "Special A – 21"
Riding through the halls underneath Shibusen in an attempt to catch up to Eruka and Free, Kid is stopped briefly when he reaches a field of bombs floating in the air. Continue Reading "SOUL EATER – 21"